Alright, so, I’ve got some good news and bad news. The bad news, Andy has decided not to draw any more for The Wotch. He tried but just couldn’t get into the swing of things for it. The good news! We have a new artist… BUT we’ve decided to commission this time. It’ll cost money, but that should help with a constant schedule. I’ve created a Patreon site to help cover these costs, as well as site expenses. I’m hoping that people will help out with this. We’re going to try to have some fillers up, but the story will resume in January. It’s the earliest the new artist will have time to get things started. We do have a new artist lined up and it does get back into the more “cartoony” style of Anne & Ian. He’ll be debuting soon — sooner for those who donate! There are very few people on Patreon who donate $15 per month. That is a tall order for early access. Good luck with that. Dunno if it changed before I saw it (either yesterday or the day before), but Early Access is currently $10, not $15. 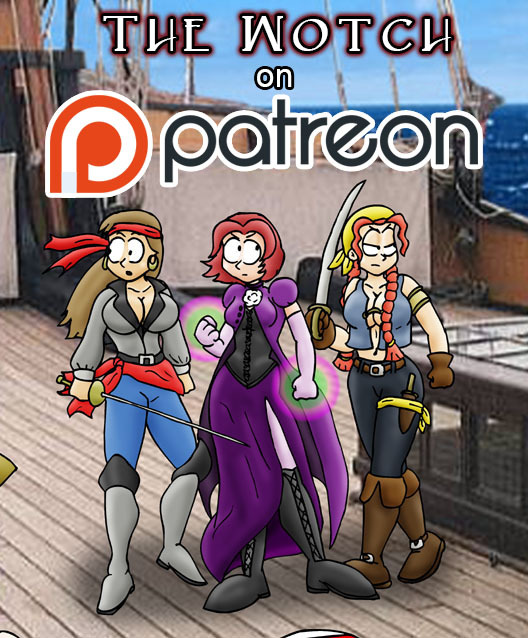 And I hold out hope that there will be a good amount of Patrons and/or donators. At it’s peak, the comic was pulling in ~$2000 a month in donations, so I can totally see a tenth to a quarter of that being possible once word-of-mouth spreads. Yes, however that was back with a relatively consistent update schedule and with the prospect of getting bonuses for donations. Since then, they have had several protracted hiatuses (which alone is pretty deminishing to support, but the more damning aspect is that there was little to no communication about it, leading many to think that it was an abandoned project), an aborted storyline and have now gone through several artists. In other words, they have a lot of good faith to make up or else it makes it all seem like throwing good money after bad. Don’t get me wrong, I hope they are able to get back into a more regular release schedule, but its going to be a bit of an uphill battle for them now. This is great news! Hopefully the comic will breathe new life once more! That is Anne’s artwork, it’s part of an old monthly bonus. It had pirates… so i decided to use it for this! 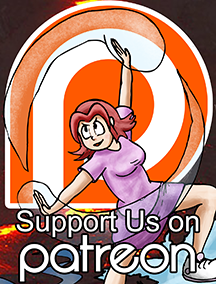 Same with the banner on the Patreon page. That’s a Halloween bonus from way back in 2007! $15 is quite steep… perhaps a lower tier in the $1 to $3 range with a simple reward like a monthly desktop image? I so prefer the classic style! To be honest, I do too. I don’t think it works to have the art style look too serious in this comic. But that being said, I’d rather see a different artist than no new pages at all. This looks like a storyline I would love to read! Sorry to hear that Andy will not be drawing the Watch anymore, but I do hope that the recovery went well. I will be looking forward to new updates and hope they begin soon. Is their still some unreleased pages of the comic done by the last artist, or is the new artist stile going to be the one we see from this point forward? If there’d been pages done by the last artist, we’d have posted them. I don’t hold onto things like that. From now on it’ll be the new artist. Or any other new artist we commission. Because we’ll be paying for pages it will keep the comic flowing. Is there a paypal one time donation option? Yes! It seems I’d forgotten to add the button to the new site after I’d recreated it. So there you go, for one time donations you can use the PayPal button there beneath the Patreon one on the right side bar. Top right, directly beneath the Patreon link, above the Ad space. I donated 5 dollars, but that offer of an OC cameo in your comic is very tempting. So…. I´m currently working on an OC for that comic, actually. Anyway, would you mind helping me out here? I usually got no problem making OCs, but it would still be nice to have a second opinion. My e-mail address is lastcarpet@yahoo.com. Oooh… I wish I wasn’t perma-poor. So many webcomics I want to throw money at. Having said that: I love that this is going to be happening. 🙂 I definitely prefer the more cartoony style like some others are saying, though it’s also sad to see Andy go. We’re currently at 253 of 300 needed. We’re currently at 257 of 300 needed. Once I’m gainfully employed, I’ll be picking up my patronage as well.